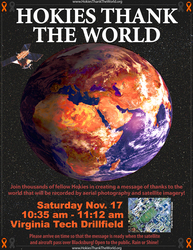 BLACKSBURG, Va., November 14, 2007 -- A "Hokies Thank The World" event will take place Saturday, Nov. 17, from 10:35 to 11:12 a.m. at the Virginia Tech Drillfield in Blacksburg., rain or shine. View of the drillfield prior to the start of the Hokies Thank The World event on Saturday, November 17, 2007. In the foreground, participants can clearly be seen standing on the marker lines that made up the massive thank you message. View of the drillfield prior to the start of the Hokies Thank The World event on Saturday, November 17, 2007. The large number of people visible in the center of the photo are filling in an outline of the Virginia Tech logo.